Clean the calamari bodies, season with salt and pepper, and place on a paper towel-lined baking sheet. Pat dry thoroughly. In a small skillet, heat the oil over low heat. Add the chile de arbol, garlic, pistachios and lemon, and cook for about 5 minutes, or until everything is toasted and the oil is infused with flavor. Remove from the heat. Use a slotted spoon to remove the lemon, pistachio, garlic and chiles and reserve. Pour the remaining oil into a large bowl. Heat a grill or grill pan on high heat. Oil grill thoroughly. Add the calamari to the grill in batches. Grill until lightly charred and crispy on the edges. Transfer to a cutting board and repeat with the remaining calamari. Slice the calamari into ½-inch rings. Drizzle the radicchio and endive with olive oil and season with salt and pepper. Add them to the hot grill and grill for 1 to 2 minutes per side or until lightly charred and wilted. Remove from the grill and place on a platter. In the large bowl with the seasoned oil, whisk in the red wine vinegar and squeeze in the juice from the fried lemon. Add the reserved pistachio mixture and the cannellini beans to the bowl and toss to coat. 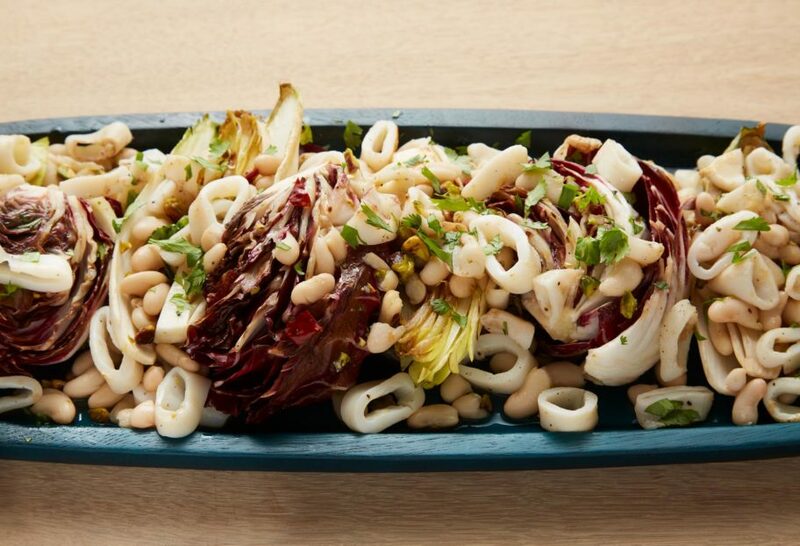 Spread over the grilled lettuces already on the platter, top with the calamari, and sprinkle with cilantro. I enjoy your cooking I like your show. A 10! Thank you so much Ayde. I am going to make it today, where can I find the video. Sorry I did not record it.